More info:From £2309 - £2409 excluding flights. Optional single supplement from £595 - £655. Mimimum age 16. 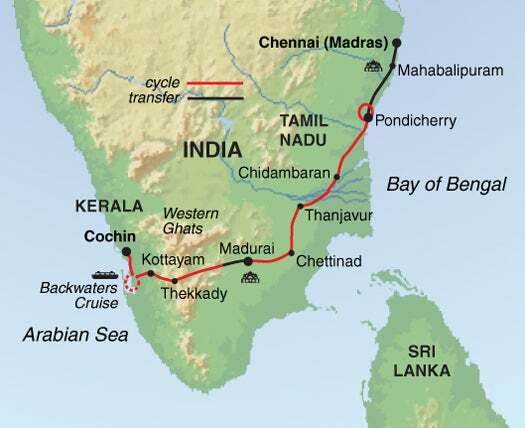 There is something very special about cycling coast to coast in any country, but this Chennai to Kochin cycling holiday across India, through the southern states of Tamil Nadu and Kerala makes for a wonderfully adventurous way to holiday here. From the Bay of Bengal to the Arabian Sea, we cycle for ten days out of fourteen, mostly on quiet back roads with the exception of some cities, such as Madurai. Staying at an eclectic mix of accommodation, from houseboats to small locally owned guesthouses to grand mansions, we are able to take in all aspects of life in southern India. After arriving in Chennai, we transfer south to Pondicherry to pick up our bikes, a former French colonial town in a stunning waterside location, which also offers a lovely flat start to our cycling trip. After a couple of days exploring in and around the town, we take our first long cycling expedition into inland Tamil Nadu, with a 100km cycle through rural villages, stopping at remote and very welcoming spots for chai and chat and really feeling like we are covering serious ground on our velo tour. Following the banks of the Cauvery River, our next urban stops are Thanjavur, famous for its royal palace and enormous Brihadishwara Temple and then the Chettinad region, where we cycle past 18th-century mansions built by wealthy traders from this period. This area is also famous for its unique cuisine, where curries are slow cooked in copper pots, perfect pick me ups for hungry cyclists, our time here made replete by a stay at one of its mansions. After another 100km cycle through Tamil Nadu’s back roads we finally arrive in one of India’s urban greats at Madurai where the magnificent Meenakshi Temple is one of the cultural highlights of the trip. For natural heritage highlights we tackle some of the Cardamom Hills, passing vineyards and plantations into the foothills of the Western Ghat Mountains, to the rainforest region of Thekkaday in Kerala. Here we spend a couple of days either resting or exploring the beauty of Periyar National Park, famous for its tiger and elephant populations. More hilly cycling awaits now, as we make our way through the plantations and hill stations that Kerala is famous for, our next urban stop being Kottayam City, with a wilder Kerala never too far away, such as on the shores of Vembanad Lake and its stunning Kumarakom bird sanctuary where we take a houseboat cruise on Kerala’s backwaters. This is our final leg before hitting the coast of the Arabian Sea and the port town of Fort Cochin, a vibrant multi-cultural city of spice markets and beach bliss. The perfect place to finish this journey on two wheels through some of India’s most spectacular land and culturescapes.